The view from 8,000 ft. This spectacular image is comprised of seven different RAW images, stitched together during post-processing. It was taken at an altitude of 1,500 feet, travelling at 65mph. Click on the image below for the full resolution version. 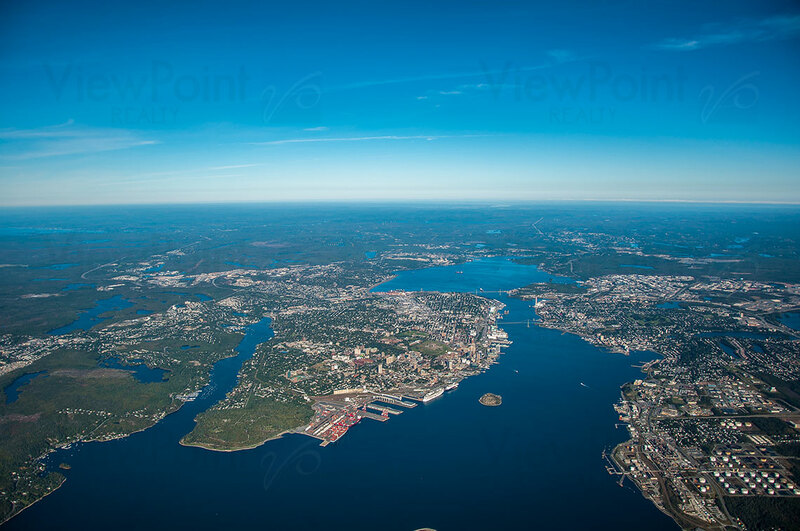 This magnificent image was taken from at an altitude of 8,000 feet from the mouth of Halifax Harbour. You can see George's Island and the Minas Basin in the same photo! Click on the image below for the full resolution version. The story behind these photos. A single photo can communicate a mass of valuable information in seconds, hence the saying "a picture is worth a thousand words". Photos are integral to real estate marketing. Every listing has interior and exterior photos which enable buyers to quickly screen properties online but gaining a perspective of a neighbourhood, community and municipality is difficult from the ground. There's no better way to gain this perspective than from a 'birds eye' view using images taken at an 'oblique' angle to the ground from the air. So, on September 25, 2014, ViewPoint Realty, in partnership with Vision Air Services, took to the skies over HRM via helicopter with ace check pilot Fred Shuman and two photographers, Tim L'Esperance of Vision Air (also a pilot) and Sean McMullen, Director of Marketing and photographer at ViewPoint. We took more than 4,000 photos from altitudes ranging from 1,200 to 8,000 feet over the course of three hours. The weather was exceptional and we hope you agree that the resulting photos are too! The images will be made available free of charge to buyers and sellers who are clients of ViewPoint Realty. For other brokerages and other uses, the full resolution un-watermarked images are available to purchase via license as a digital file or mounted. Prices vary by size and format. Photos are priced according to the resolution and whether or not they are ordered mounted. The higher the resolution the larger the photo can be printed. Mounting is on 3 millimeter aluminum panel (Alupanel) with polyethylene core. Look, feel and rigidity is impressive. A representative from ViewPoint will contact you to arrange payment and fulfillment.